Age 90, of Mecosta, Michigan, formerly of Holt, Michigan, passed away Monday, April 1, 2019, in Mecosta. He was born April 3, 1928, in Lansing to the late Dorr and Ada (Hause) Farr. Rolland was a talented builder, wood worker, and had a special talent with the scroll saw. He was a wonderful father, grandfather, brother, uncle, and friend. He will be deeply missed. 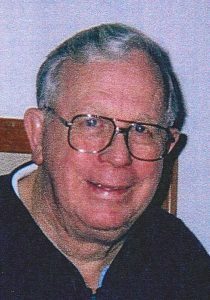 He is survived by his daughters: Susan King and Annette Bussell; sisters: Pat McKenzie and Dorna Christenson; brother, Arthur Farr; grandchildren: Daniel Farr, Rene Gaskin, Nathan Farr, Phillip Farr, Shannon Cummings, and Chad Bussell; nine great-grandchildren; his loving nieces and nephews; and his many friends. Rolland was preceded in death by his wife, Joan Farr, son Daniel Farr, great-grandson Michael Genaw, sister Bernadine Groh, and brothers: Gale Farr and Trevor Farr. There will be a visitation for family and friends 11:00 a.m. to 1:00 p.m., Thursday, April 4, 2019 at the Estes-Leadley Holt/Delhi Chapel. A private graveside service will take place. In lieu of flowers memorial donations may be made to the charity of the donor’s choice. Our prayers are with the family. He was a wonderful, kind man who watched out for all of us in the neighborhood. We will miss his chats and fatherly advice. My thoughts and prayers are with everyone who knew Rolland Farr! He was such a kind, loving, and caring person with a great sense of humor, many skills and talents! I will surely miss the reminiscing, long conversations and laughter we shared whenever we were able connect! He will always be I in my thoughts and in my heart! Thank you Uncle Rolland for everything!!! Love you!! So sad to hear of Rollie’s passing. I considered him my surrogate dad!. Always looking out for me. Such a smart talented man. He will be sorely missed by everyone in the neiborhood.